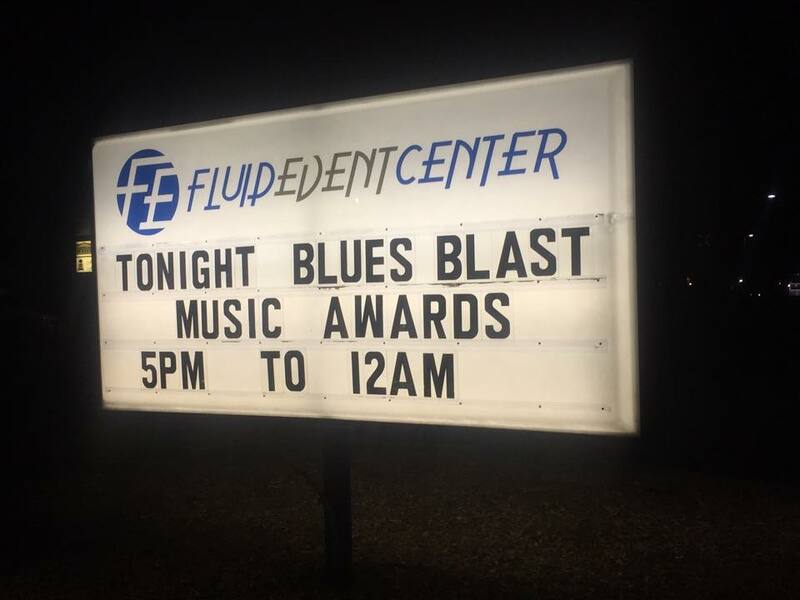 I was glad to see that they decided to have the 2015 Blues Blast Music Awards in Champaign, Illinois. This is a college town that is quite a hike from downtown Chicago but it worked out well last year to have artists and fans head 2 ½ hours south to attend an awards show. They improved over last year’s plan and held it on a Friday night instead of Thursday, which made everybody’s planning a little easier. 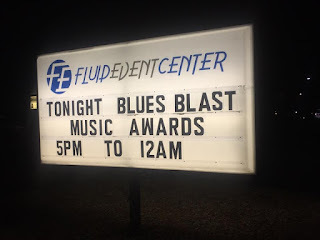 At first glance, the Fluid Event Center seems like an odd building for a big blues show, as it is an old lumberyard barn that has been converted to a multi-use facility. It worked very well with a huge main hall that is cavernous when compared to the clubs that had been used before last year. The size of the room allowed two full-sized stages to be set up, so that there was little downtime for band changes, which helped keep the event on schedule. The stages were also generously sized and positioned higher so that everybody could better see the action. And there were plenty of folks that made the trip to Champaign for the 5:00 start time. There were a few dozen artists on the bill, and all of the seats would have been taken if everybody were in the hall at the same time. This did not happen often, as there was good catering and drinks that were reasonably priced. The prices were light-years away from downtown Chicago prices, with $4 domestic beers and meals that were under 10 bucks. Not to mention that parking was FREE and plentiful. It would be hard to go wrong after a set-up like this, and when you figure in the fabulous entertainment and the opportunity to meet some of your favorite blues artists the $45 ticket cost was the bargain of the year. For blues-rock lovers, Reverend Raven and the Chain Smokin’ Alter Boys tore the house down, and Markey Blue was just amazing beyond words. Once again, the Andy T Nick Nixon band was the house band, and they did a stand-up job of supporting the artists that were not able to bring their bands with them to the show. But for pure entertainment value, I have to give props to Matt Isbell and the Ghost Town Blues Band, who were one of the last bands up for the evening. They entered with their traditional march into the hall and rocked out for their 10-minute set – I have to say that they were the only band that brought trombone and Led Zeppelin to the Fluid Event Center. The fairly subdued crowd really woke up and started paying attention when these guys were on stage! It was great to see Eddy Clearwater and Jay Sieleman get their lifetime achievement awards, as well as finally getting to see Deb Ryder and the marvelous wiunderkid Magnues Berg in person. And it was also fun to connect with artists whose music I had reviewed, and none of them seemed too upset with me! All-in-all, it was a worthwhile evening and I am sure that nobody regretted making the trek to Champaign for the show. I would certainly not mind heading out there for the 2016 Blues Blast Music Awards, if that is where Bob decides to have it.